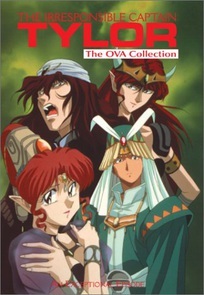 This is the first in a set of made-for-videotape (OVA) releases made shortly after the "Irresponsible Captain Tylor" TV series concluded production, and is sometimes known by fans as "Tylor's War". They deal with events that occur about six months after the conclusion of the Raalgon war. The shape of the future will be determined by the actions of very unlikely allies. Their choices will be difficult and their situation may well be hopeless. Any hope for galactic peace rests on the most irresponsible man in history. Perhaps Tylor will stay awake for this. DVD Features: "The Undefeated Soyokaze" 4 Music Videos Featuring the entire cast!